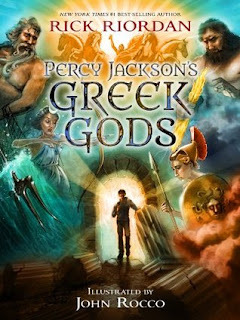 To Sum It Up: Percy Jackson tells you everything you need to know about how the world came into existence and the origins of the twelve Olympians! Review: First, I have to confess something: I’ve only read one Percy Jackson book, The Lightning Thief. Unthinkable, I know. I am striving to make 2015 the year of the sequels, and reading the rest of PJ’s books is one of my top goals, especially after loving every page of Percy Jackson’s Greek Gods. I first clapped eyes on this wonderful, wonderful tome while out and about shopping. It is a most handsomely packaged book that demands a highly visible place on one’s bookshelf. It’s printed on glossy paper, which enhances the brilliance of John Rocco’s illustrations. They are stunning, and some of them are full page. On glossy paper! So yes, the mere appearance of this book practically had me drooling. Then I started flipping through the pages and soon proceeded to burst out laughing in public. Book. Sold! I cannot convey in words how hilarious Percy’s narration is. I don’t even remember how many times I laughed out loud while reading (but this time in the privacy of my own home, where I could cackle as much and as loudly as I wanted). I mean, this guy really knows how to (re) tell a tale. At the same time, Percy makes sure to point out how crazy the Greek gods and goddesses could be, and how badly they could behave. And we all know that very often, they behaved very badly. My fascination with Greek mythology began in elementary school, and if I’d had a copy of this book back then, I would have been ecstatic, as well as off to an excellent start learning who’s who among the gods and goddesses. Even as an adult, I found Percy Jackson’s Greek Gods extremely informative; it filled in a number of gaps in my Greek mythology education and refreshed my memory on some of the myths I was already familiar with. All of the glorious Percy snark was an added bonus and made this my new favorite Greek mythology book. Just the way he envisions how conversations between the Greek deities went—priceless. One more thing before wrapping up this review: this book is coffee table-sized. It truly is an amazing piece of work, both in presentation and in content. The eBook version might be more portable, but I strongly recommend opting for the hardcover with this one. You will not regret it! All in All: I think anyone who loves Greek mythology should read this. Percy is a fantastic storyteller, the artwork is gorgeous, and you get a solid overview of Greek mythology that never fails to be entertaining. Read it! I'm also really skeptical of these not-quite-spin-off books, but this one was a lovely surprise. I'm glad that I took a look at it firsthand before buying it, though; that way, I was positive that I would love it! Percy's take on Greek myths was just brilliant- and laugh out loud funny! Definitely worth a read. I really want this one. Zane and I have both read all of the Percy Jackson original series and are working on the follow-up one. You wouldn't believe the amount of Greek mythology trivia we are good at just from reading these books :D We watch trivia game shows together a lot and can always answer the Greek God/Goddess questions with ease. I think this one sounds very fun and informative! WHY DID I NOT KNOW THIS WAS A THING?? I still haven't finished The Lost Hero series (and may never get to it...) but I did love all five Percy Jackson books and like you, have also had a fascination with greek mythology since I was young! So it's so cool to hear about this book and I like that it's informational but not in a stuffy way since Percy is actually narrating it. Definitely have my eye on this now! And I WILL GET THAT HARDCOVER. No ebook for me, I WANT THE BIG THING!! I absolutely recommend getting the hardcover! The illustrations are BRILLIANT and meant to be appreciated in all their full color, glossy glory, lol. Percy's narration is the perfect mix of info and humor; I learned a lot and laughed a lot!